You’ve dreamed of owning your own home in Paris, but realize that you just can’t afford it on your budget. But did you realize that numerous historic towns within an hour of Paris are vastly more affordable, and interesting in their own right? Consider looking in these three charming towns with properties for under $250,000. Perhaps you’ve heard of this town or even visited the stunning 1,900-room chateau that bears its name. 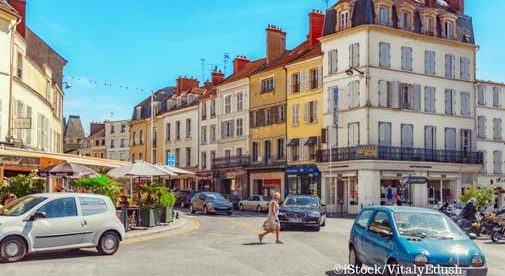 While Fontainebleau castle may shimmer with riches, the 13th-century small city offers a down-to-earth existence and surprisingly affordable real estate. Apart from the castle, Fontainebleau is famous for the magnificent forest that surrounds the town and is a favorite hiking spot for Parisians seeking to take a break from the energy of the big city. The town is also famed for being the home of INSEAD, a graduate business school that draws a huge international crowd. It’s a great place to be if you like quiet living but want ready access to the diversions and excitement of Paris. Right now, there’s currently on the market a one-bedroom 624-square-foot apartment that has classic Parisian features: gleaming hardwood floors, interior French doors, a stone fireplace, and built-in bookshelves. South-facing windows offer wonderful views of the rooftops of the town, a distant view of Fontainebleau Cathedral, and the thick green forest beyond. The asking price is €189,000 ($232,870). The apartment is only a 10-minute walk from the town center and train station, enabling you to pop into Paris whenever you feel like it. But you may not want to: Fontainebleau offers plenty of its own attractions, including excellent restaurants, shops, parks, and meetups with other local expats. And it’s gorgeous, to boot. Samois is another big expat haven, less than 15 minutes from Fontainebleau and an hour from Paris. This small town is a bit sleepier than Fontainebleau, being more pastoral and lying right along the Seine river. But its tranquility and beauty have attracted numerous expats from Paris. Being as attractive as it is to Parisians looking for a quieter life, real estate prices in Samois can be high. Nonetheless, attractive properties are still available. For example, there’s a bright, spacious modern villa for sale right now for just €189,000 ($232,870). The 1,108-square-foot property has two bedrooms, an office, a vast open kitchen, a large sunny terrace, and a 2,152-square-foot garden. If you prefer an older house, there’s one available for €204,000 ($251,350). This 19th-century beauty needs some renovation but has excellent potential with its exposed stone walls, wooden ceiling beams, and wood-burning fireplace. It currently has only one bedroom, but other rooms can be easily converted to a second or even third bedroom. The property also has a small, pretty garden surrounded by a gorgeous honey-colored drystone wall. It would make an excellent pied-à-terre for a couple. Like Fontainebleau, Chantilly is a lovely town centered around an exquisite fairy-tale-like chateau, the Château de Chantilly. The castle is famous for many things, including that it’s considered the birthplace of crème de Chantilly (or whipped cream, as we call it), and that it houses the most extensive collection of historical paintings in France outside of the Louvre. The town also has a famous Hippodrome(racecourse), which was featured in the James Bond film, “A View to a Kill.” Chantilly has so many Anglophone expats that it has a cricket club, American football team for kids, and organizes regular expat dinner outings. 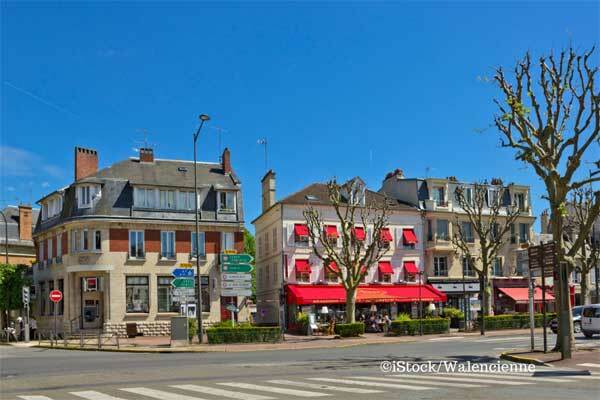 As Chantilly is only 35 minutes from Paris by train, real estate prices tend to be on the higher end. But there are several excellent properties currently on the market for less than $250,000. For example, you can buy a lovely 617-square-foot apartment for €183,000 ($225,000). It features two bedrooms, a spacious living room, a fully equipped kitchen, and a balcony that fits a table and chairs for two, and looks out on a peaceful green park.